If you traveled back in time to my son’s toddler days, you would find us on his bedroom floor, surrounded by wooden train tracks. My son: the one clutching at train in his chubby toddler fist as he ran its wheels down the almost-finished track. Me: the one building my masterpiece railway at lightning speed, trying to connect the last stubborn track before my ambitions ended in disaster. In those days of endless laundry and endless potty training and endless bedtime routines, all the intensity of first-time motherhood kept me from writing. Wooden train layouts became my creative outlet. Before long, our initial wooden train set limited my artistry. A local toy store we often played at sold individual tracks. Switches, adapters, buffers — I picked up whatever I’d been missing when I built our last layout. I combed the internet for more unusual tracks, new brands we hadn’t tried yet, sets with unique switches or bridges. As word of our train obsession spread, parents and grandparents and teachers came to me for advice about which wooden train brands were worth the investment. And several years later, they still are. After all, you’re reading this right now! To this day, if I had to pick my favorite part about wooden train sets, I’d have to choose wooden train tracks. The tracks are beautiful. They feel real and solid (too rare with toys these days). They present both an intellectual puzzle and a creative opportunity. It’s no surprise this was the first installment I wrote in our Ultimate Wooden Train Guide when I started it years ago. 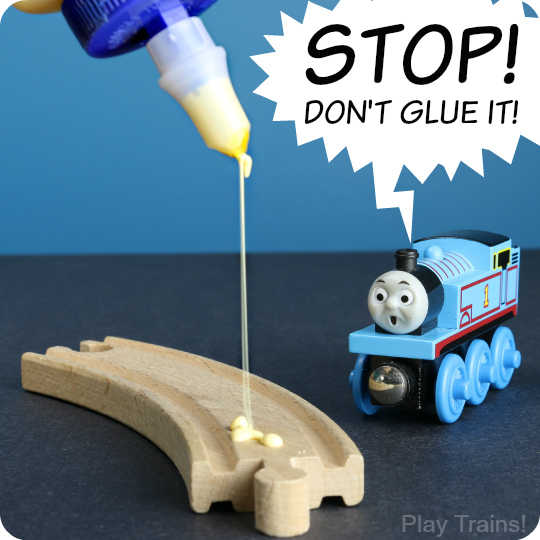 In this post, I share the knowledge I gain through our experience with many brands of wooden train tracks, including product recommendations and answers to frequently asked questions. Click on the name of each brand to be taken to a search on Amazon for their wooden train tracks. By the way, if you do click on one, we will receive a small commission — at no additional cost to you — on anything you buy at Amazon for a certain length of time afterwards. Read our disclosure policy for more details. Thomas Wooden Railway: While Thomas track is my favorite by far — at least back when it was being made by Learning Curve — I’ve rarely seen their track expansion packs for reasonable prices, and so we only get Thomas track in train sets. Chuggington: Chuggington and Thomas Wooden Railway used to be made by the same companies, so Chuggington track is similar in quality to Thomas track from several years ago, but with a different railroad tie design on the tracks. Brio: Brio makes good track, although I like the feel of the Thomas track better. We’ve only ever bought Brio track as part of a set as well, but they do offer different packs of track. They seem a bit on the expensive side to me, though. Melissa and Doug: I’m often asked about M&D train sets. While I’m hesitant to speak to the quality of the trains and accessories because we don’t own any, I can say M&D does make good train track, and their six packs of single types of track tend to be a good value. Bigjigs Rail: Bigjigs has some well-priced tracks for you to consider. Their set of two T junction tracks has two male connectors instead of only one (or none) like T junctions usually have. They also make some fun tracks, like their freely-curving Crazy Track (similar to the old Thomas-brand Wacky Track) and their Wavy Track. They also offer the least expensive option I know of for buffers/bumpers in their pack of 6 track buffers, though the design is bare bones in comparison to the pack of four track bumpers from Orbrium Toys. Conductor Carl: If you’re going to buy bulk wooden train tracks, I recommend Conductor Carl. I used it to create the “old” wooden train set in Old Tracks, New Tricks, as well as my traveling train set I take to all my book events. This is the track you want for DIY projects where you’ll paint the tracks, or if you’re worried about the safety of other brands, because all of the male/plug connectors are cut out as part of the wooden track, rather than added as plastic plugs — even on the switch tracks! There did seem to be a quality control problem with this brand last year (2016), but all of the boxes of track I’ve bought this year (2017) have been fine. Jesse’s Toy Box: This is another brand of track I recommend. It’s a good value, but as of this writing, it’s hard to find. IKEA track (old style with plastic connectors): The track in the old style of IKEA train sets works well enough, but there are some compatibility issues with other brands of track (see below), the range of track pieces is limited, and the bridges are too low for trains from most other brands to go under. Nuchi: This used to be our choice for expanding our track collection, but it now appears to be unavailable. However, if you can pick some up secondhand, I recommend it. They made good wooden tracks. Maxim: A budget brand of train sets and track, Maxim does offer a pretty wide selection of wooden track. While it would not be my first choice for quality, Maxim does sell several switches and other interesting tracks you may have a hard time finding elsewhere. Maple Landmark: If you’re looking for made in the USA wooden train tracks, here you go. They’re beautiful in person, but expensive. In my preliminary play tests, I noticed they’re so well made, and cut to such exact precision, that it can be a bit harder to put them together. However, it’s possible the perfect edges would wear away with more play and connecting the tracks would become easier. Orbrium Toys: Here’s another lesser known but reasonable wooden track brand. The standout purchase here is their set of 8 Male-Male Female-Female Train Track Adapters, something every wooden train set needs. However, I’m not recommending their track as enthusiastically as I was before after ordering a full box of track to review. The male-male and female-female adapters we ordered before were great, but there’s a great deal of inconsistency within the big box. But the track is workable if the price is right (see my note about sanding tracks below). 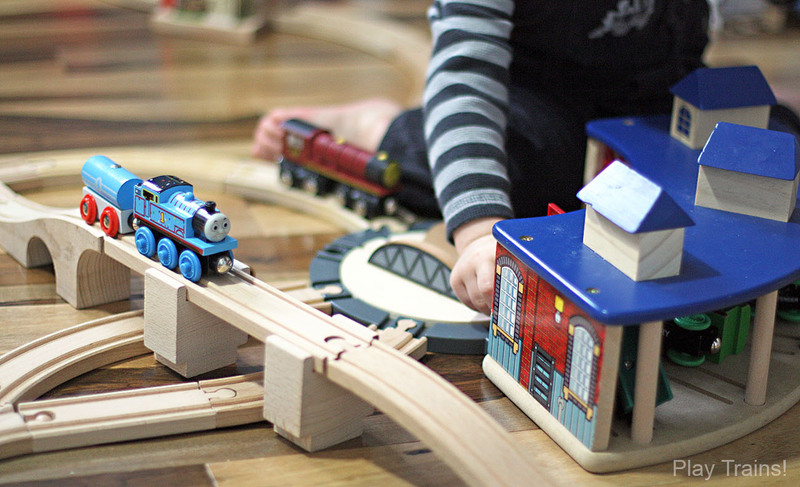 A reader reminded me of the Choo Choo Track and Toy Co., which makes their wooden train tracks here in the USA. They have a couple of rare track types worth mentioning: 12-inch curve tracks (they form a circle with a 30-inch diameter) and a 12-inch “wiggle track” (similar to the wavy track above, but with more curves). I’m ordering some soon to try out. it might have been made by them! Note: with many of the budget brands of track, you may want to take a piece of sandpaper and sand down any rough cuts. Saws cutting curves across the grain of the wood are often the cause, so check curves, switch tracks, and the ends of tracks for anything rough, splintery, or sharp. 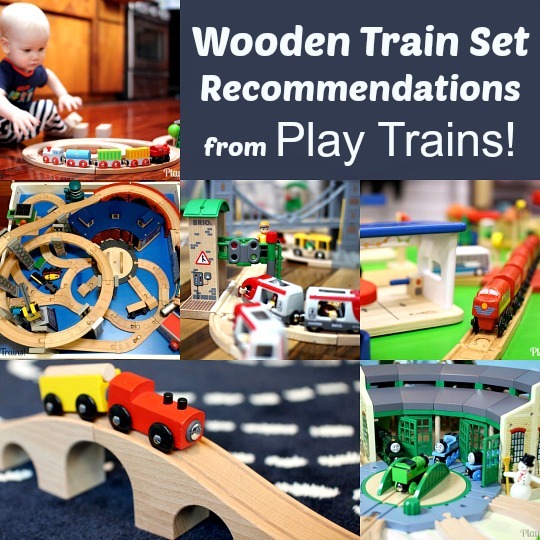 If you’re interested in purchasing a wooden train set — and I recommend this as a good way to start a collection, or to add more track and new and interesting features to an existing train set — please take a look at the Play Trains! Guide to the Best Wooden Train Sets, where I’ve broken down the current options I recommend by brand. What brands of wooden train tracks work together? In our experience, Brio, Thomas, Chuggington, Nuchi, Bigjigs, Jesse’s Toy Box, Orbium, Conductor Carl, Melissa and Doug, and Imaginarium track all work well together. The connectors on Ikea track are a tight fit with other brands, sometimes too tight to work. I have, however, used Ikea tracks on purpose when I needed two tracks to stay together well. The old-style wooden Plan Toys track never fit well with our other tracks; I haven’t had a chance to test their new pressed tracks, so they may be better. Is it better to stick to one brand of track, or build a collection from several different brands? I love having a range of brands to work with. There are subtle differences in the lengths of each brand’s version of each style of track. Why is this a positive thing? Well, when you build a complicated layout, often you need the last track to be a little longer or shorter to make the whole thing work. Thomas Wooden Railway tracks tend to be shorter than other brands, so if I need a track to be shorter, I dig through and find a Thomas track. If I need a track to be a smidge longer, I replace Thomas tracks with other brands. Are Trackmaster trains compatible with wooden train tracks? Yes…to some extent. 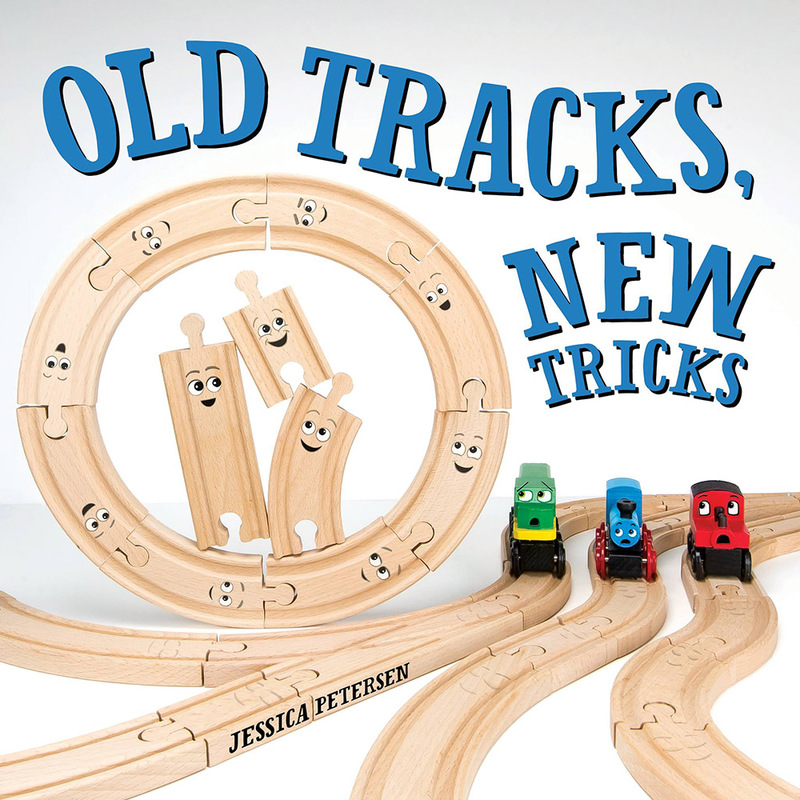 Trackmaster wheels are the same gauge (width) as wooden trains, so the trains will run on wooden tracks. However, they can’t take the tighter curves under their own power without derailing, and they won’t go up the bridges. 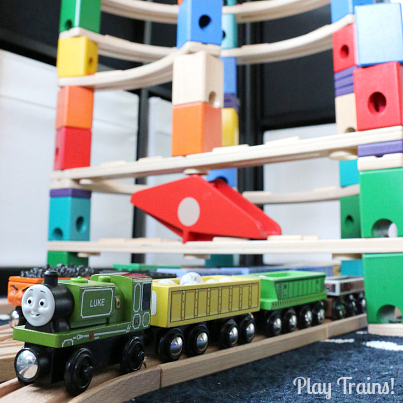 Are Take’n’Play trains compatible with wooden train tracks? Sadly, no. Take’n’Play trains are too narrow to run on wooden train tracks. 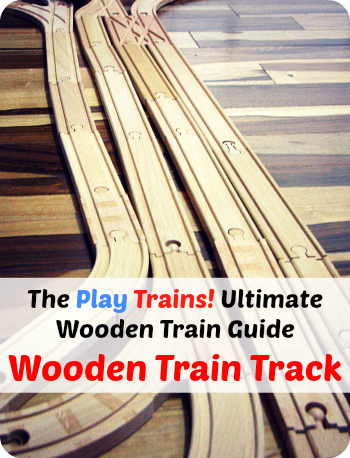 Are wooden trains compatible with Trackmaster and Take’n’Play tracks? Yes! 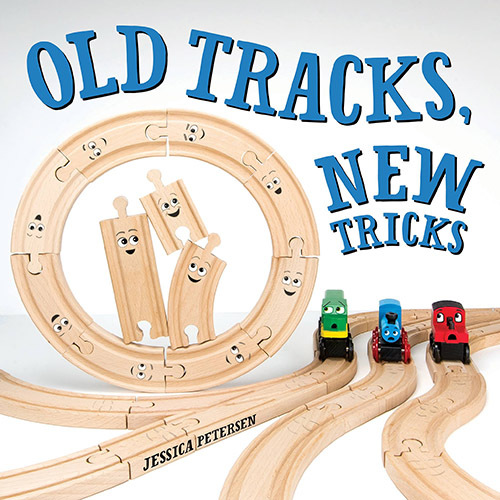 Wooden trains fit on Trackmaster tracks, and Take’n’Play tracks seem to be intentionally made to be wide enough for wooden trains because they are too wide for the trains they’re made for. However, both of these tracks are much harder to work with when building a train set. Take’n’Play tracks tend to fall apart often, and neither type of track has the flexibility that comes from the wooden tracks being able to shift from side to side and up and down at their connections. And there’s a lot less variety in the types of tracks you can get for these lines of trains. On the other hand, I like having some of these plastic tracks around for activities where the tracks might get messy or wet. This guide will be expanded with time. Have a question I didn’t answer? Ask in the comments or by email! I haven’t tried their track yet, but from the reviews they sound like they’re more or less a good deal. I was going to post this link to them on Facebook today…it’s the larger set, and it looks like it’s $10 off the usually discounted Amazon price today. ETA: I just noticed that I’d written this years ago and wanted to say for anyone reading through the comments that at this point I don’t recommend purchasing Right Track tracks. Thanks! One more question – I just found out my mom is getting our son the Bigjigs figure eight set (thanks to your recommendation, I put it on the wish list 🙂 ), and I had already bought a simple Thomas circle set. Since this will be our son’s first exposure to wooden trains, I’m going to hold off on the big box of extra track until I see if he enjoys them, but I would like to buy a few pieces so that we can make an interesting track layout with the two sets he is getting for Christmas. Do you have specific suggestions for a few key pieces that will allow us to use both the circle and figure eight tracks? Thanks! Happy to help! Hmm…I’d get one of those six-packs of long, straight tracks I mention up in the post, and then two 6-inch switch tracks like these. The straight tracks will let you make the track quite a lot larger, and then the switches (combined with the curves from the circle) will add some variety to the route. Thanks Jessica! I bought the pieces you suggested, and used the links on this page, so hopefully you will get credit from Amazon 🙂 I’m so excited for Christmas to get here! We went to a train museum a couple of weeks ago that had a hands-on wooden track for the kids, and my son really enjoyed it – now he will have his own to play with! Thanks for the great overview! My son has recently gotten into the Thomas trains, not through the television show, but through the play tables that are at Barnes and Noble and the B&O Railway Museum. I had some Toys R Us gift cards; so, I purchased him the Thomas Coal Hopper Set and he loves it. Anyway, my wife and I are thinking about getting him one of the nicer train tables for his birthday and my question is regarding the quality of the actual tracks. From some of the research I’ve done, I’m worried that using the non-Thomas tracks might exacerbate the issue of the trains falling off the track through turns. Have you noticed a tangible difference in the track quality between the less expensive brands? We are thinking about going with the Imaginarium Mountain Rock Train table as it seems to have the most bells and whistles. Thanks again! You’re welcome! That’s how we got into Thomas trains…first the B&N train tables, then through owning our own at home and reading the Thomas Wooden Railway catalogs over and over. Slowly we phased in the books, and then the TV show and movies. I think that’s the best way to do it, because we were able to form our family’s own ideas about the characters based on just a few facts that we knew, and to this day, our versions persist in our imaginations. No matter what brand you go with, the trains will fall off the tracks if there are turns at the bottom of steep slopes. The only way to fix that is to add a long enough straight track at the bottom of the hill that the trains expend enough of their forward momentum before turning, which is hard to fit in on a train table. There are a few Thomas and Friends sets that came out last year that have a feature that may help with that…read the Thomas section in my wooden train set guide if you’re curious (http://play-trains.com/best-wooden-train-sets/). And I have some tips regarding keeping the trains from derailing at the bottoms of hills in the bridges and elevated tracks guide (http://play-trains.com/wooden-train-bridges-elevated-tracks/). I personally don’t recommend train tables in most situations. In exchange for keeping the trains up off the floor, they introduce a lot of hurdles to building interesting layouts. Also, many kids seem to like them a lot more at stores than they do at home. In our case, of the two we’ve had, the one at Grandma’s house was sold in a garage sale after a year of sporadic use and a year of storage, and the one in our house only gets used as a rare change of pace from the floor. That said, if you think a train table will work best in your situation, the Imaginarium train tables are decent quality, and you get an interesting selection of stuff with them. We still use most of what came with ours, and though the table is gone now, when I last saw it, it still looked brand new. The track is not as high quality as some of the other brands. Mainly, it feels light and dents easily, but it’s held up okay for us, and I don’t think it will make much of a difference when it comes to trains falling off the tracks. 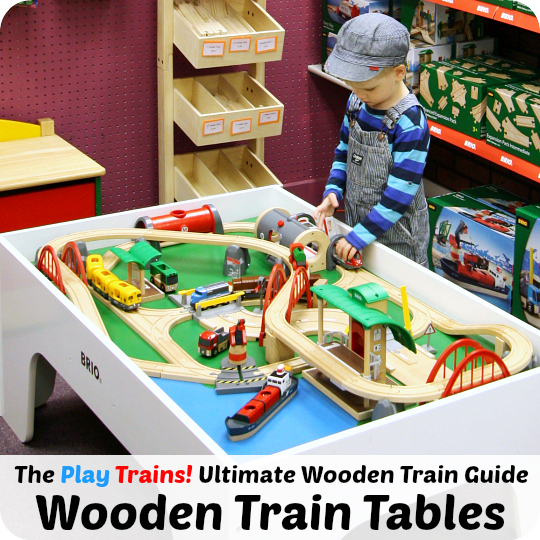 While adults like train tables for the sets that might be included, or the management of a child’s toys in a small space, train tables quickly tire the children who use them. As soon as they obtain accessories for which the table has no room, everything gets put on the floor. The floor enables tracks to run between and under furniture and sometimes from room to room. You can’t persuade a child to move back the other way, to the table. If you get a table with a lot of room for expansion with more track, people, accessories and loose trains, the table might remain the primary play area. The usual family experience is demonstrated by the very large number of lightly used tables being given away or sold for peanuts on Craigslist. Once in a while, a train table can be converted for other uses. Be cautious. Jon, I completely agree! Our train table is getting much more use as a Lego table now that my son is older. Otherwise, we never have used it much with our trains…once in a while as a novelty, it’s been fun, but otherwise the floor is so much easier! Very happy to have helped! I really need to write my post about this…thanks for reminding me how important it is! Hi! Thank you for the information. I just bought some used Brio switches that have plastic male connectors (they came as part of a Travel Switching Set). Two of the three male connectors have somehow worked themselves out of the wood or gotten pulled out, so that there is a gap between the switch and the next piece of track. Is it common for this to happen for this type of Brio switch? Thank you. It happens to those plastic connectors across most of the brands…that’s why it’s such a joy to find switches that don’t have them! I don’t think it’s happened much to our Brio tracks, though…they’re usually pretty well made. Are the connectors completely separated from the tracks, or just sticking farther out than they should? I’ve managed to push some of ours back in when they’ve gotten pulled out a little too far. Thank you for your answer. The plastic connectors were not completely separated and I was able to push them back in so that the switches are satisfactory, though there is sill a tiny extra gap. Hi. Thank you for all the helpful information. It’s come in very handy! I was wondering if there is a way to tell the difference between tracks that don’t have their packaging? We just received some track bits and would like to add to them but don’t know the brand. They have wood grain looking stripes along them, where as others I’ve seen are just plain wood grain. Any ideas? Thanks! Sometimes you can tell! Any chance you can send me a photo, either to my email ( jessica (at) play-trains (dot) com ) or even posted to our Facebook page? I have a random question, my son was just gifted some old wooden train tracks and he is more interested in making them “race car tracks” . The thing is we only got like 4 pieces that have a top side for trains and the bottom side has a flat middle that can be used for cars. WHO MAKES THESE TRACKS!!! I have spent the last two days googling wooden tracks and still have no clue!?! I hope you might have an idea! Thank you in advance for all the time and dedication you have shared with everyone! If they have a brownish railroad tie design pressed into the top side for the trains, and a dashed line down the car side, then they’re Thomas Wooden Railway tracks. In the past, all their straight tracks came with the road printed on the back, but you had to buy the curved tracks separately in a special pack. Of course, they don’t make the curved road tracks anymore as far as I’m aware, and they may not be printing the lines on the backs of the straight tracks anymore. However, if you search for “Thomas Wooden Railway road” on Ebay, some results come up, including some with the curves. You my lady are a wealth of information! Thank you for all your tips!!! Help! My son just inherited tons of learning curve Thomas trains from my nephew, however, the tracks are long gone. We bought a set of wooden tracks, but they are too wide for the trains. What tracks will fit these trains? Thank you! Hello. 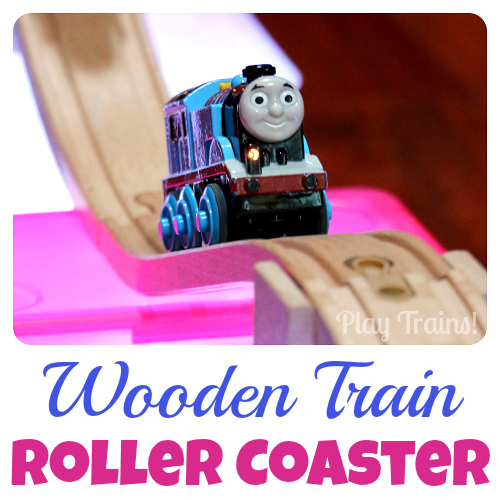 One question, can I use Thomas wooden cars on Brio track? Would this set be compatible with Brio track? Fisher Price responded to a question and said no, but your site says they should work. Have you tried them? How weird! Yes, they’re compatible. They’re replacing Thomas Wooden Railway with Thomas & Friends Wood, which has tracks that are not compatible with all the other wooden train brands, and it looks like my hunch that they’re determined to throw compatibility out the window to try to trap people into only buying their wooden trains is probably true if they have their employees posting — to be blunt — lies about the compatibility of the old stuff as well. Hi which brands are compatible with Battat All Aboard pieces? I got a 34 piece set for my son as a gift or should I just start with another brand and collect from there? He is obsessed with trains!! Thank you! Thank you for all this information! I’ve tried to read through your site and comments before asking, but I am a first-time buyer looking at a Battat set with the cheap IKEA expansion pack and you mentioned the fit being snug a few times. Is your response above with the “new” pressed IKEA tracks or the ones with the plastic connector piece? Did you have a chance to test out the compatibility of IKEA’s tracks available now with other brands? Thanks so much! Appreciate your help! Hi Kristy! Good catch on the IKEA tracks! My response above is for the old plastic connectors. I had a set of the new IKEA tracks waiting to be play tested, so I opened up just now and tried it with the Battat tracks. They seem to be nicely compatible. The one noticeable difference is that the Battat tracks are much smoother than the IKEA ones. I’m also happy to see that all the tracks in the new IKEA set have wooden connectors…for some reason from the packaging I feared that the ascending tracks still had plastic ones. Very happy to see that they made the decision to make their train sets compatible (and safer!). Great website! I was wondering if you could help me.I have 50 or so Thomas the train and friends take and play trains, purchased for my grandsons. But they like to link them together and form larger trains. But the take and play tracks are not as nice as the wooden tracks- is there one that will work with the narrower wheels on the trains I have? Hi Sherrie! That sounds like a fun collection of trains! They aren’t quite train tracks, but the best thing I can think to recommend are wooden roads that are made to coordinate with wooden trains. I just double checked that Take’n’Play trains work with them, and they roll really well on ours. Because they don’t have the raised portion down the center, the Take’n’Play trains can roll on them just fine. You can find them sold in packs of just the roads, and also as part of larger train sets. And the nice thing is that other toys (Hot Wheels, Thomas Minis trains, wooden trains, etc.) all will work on them as well. The options I’ve seen include Brio roads (these are the ones we own), Plan Toys roads, and Bigjigs roads. Another option is to find some old Learning Curve Thomas Wooden Railway track on eBay. In the past, when Learning Curve was producing their wooden train sets, all their straight tracks came with the road printed on the back, but you had to buy the curved tracks separately in a special pack. Of course, they don’t make the curved road tracks anymore as far as I’m aware, and they may not be printing the lines on the backs of the straight tracks anymore. However, if you search for “Thomas Wooden Railway road” on Ebay, some results come up, including some with the curves. Hello! Thank you for sharing your knowledge! It can be overwhelming. We have a large blended family, so with 5 kids to think about we have to budget come Christmas time. So I have been looking for used train tables online. Reason being we got 5 in 1 Train Master Thomas set and another Train Master mail delivery one about a year ago for birthday and Christmas presents and admittedly we have only set them up a few times. They are time-consuming to set up and and it seems that the track needs adjusting from time to time especially when they are not as sturdy honor carpet. We don’t have a large home so they would get left out for a few days and then we’d get tired of stepping over them and they get put away. But our boys love the battery powered trains. We don’t have a large budget so I wish that I would have done a little more research before buying into the trainmaster sets for their ages. The five-year-old will probably do better this year but he still gets very frustrated with little brother 4 wrecking his things that he builds all the time! LOL we do have some trains that were given to us by a cousin that are diecast that came with four plastic little track pieces but I know they fit in the wooden tracks. At this point I’ve wondered if we should just get rid of the Trackmaster sets and invest in something else. Again most of the brand new options for a lot of these things are not within our budget. Or one solution I thought was to get a train table that could fit at the foot of their bunk bed and could maybe be a home for the Trackmaster sets so they could be left up for a while longer and wouldn’t get kicked or stepped on or would maybe have a lesser chance of getting ruined by the three year old. Sorry to ramble on but with a limited budget I’m feeling a little frustrated and a little sad and guilty about the ones that we bought just sitting and not getting played with. I would love any advice that you could offer! Thanks so much for your time! Thank you so much for this amazing bank of information!! My son has a collection of Imaginarium tracks & accessories with various brands of trains. 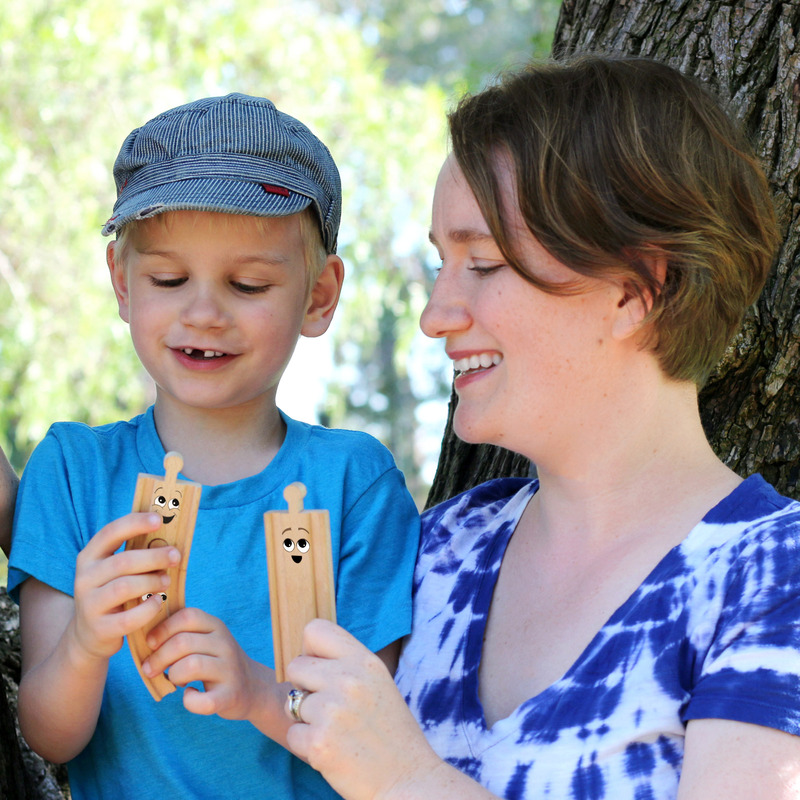 Have you encountered Battat All Aboard pieces at Target? I can’t seem to find any info on the web regarding Battat compatibility with other brands. You’re welcome! 🙂 I just pulled out a Battat set and an Imaginarium set and tried them together. They seem to be completely compatible…no issues with the fit of any of the pieces of track I tried, and the Imaginarium train (the taller of the two sets’ engines) fit under the Battat bridge. I also tried a Thomas and a Chuggington engine under the bridge and they both fit. Hope that helps! Firstly thank you for this treasure trove of information, my son (almost two) has a very basic Lelin set currently and I’m looking to expand, one thing I would love to hear your opinion on is electric powered engines. From what I’ve read the Thomas ones are the best as they are 4 wheel drive and tend to not get stuck or derail, however I was wondering if you could recommend any others? The Thomas ones are $50 each…. do you know of a cheaper and still good electric engine? Hi! So glad you’re finding the site helpful! Thomas engines do seem to be the strongest. (It looks like you can get them for under $20 at Amazon currently.) Our favorite battery operated engine, however, is the Brio remote control train. It’s just fun to have the remote control, even if it’s less powerful. 🙂 Hope that helps! I wish there were some stronger trains on the market in general. The Thomas trains are still not as strong as one could wish for. Hi, we bought a Thomas basic figure 8 starter set in the US while staying there. We are now based in South Africa and looking to expand our set, but in SA, Thomas sets are prohibitively expensive due to import taxes. I have seen that the Hape sets are not too expensive. Are Hape and Melissa & Doug tracks compatible with Thomas tracks? Secondly, which brands offer the best incline tracks compatible with the lego platform tracks? Hi! Both Hape and Melissa and Doug tracks are compatible with the Thomas tracks, so no problems there. As for the best incline tracks, we haven’t had any problems with any of the tracks that we’ve used them with other than, at least in the past, there could sometimes be an issue with Thomas ascending tracks being a bit too wide (this can be fixed by filing away a bit of the plastic to allow for the wider track). I let the company know about that issue, though, and I believe it was fixed. Hope that helps! I’ll try to get our platforms and tracks out when I’m home later and give you a more definitive answer about which brands work the best. Your website has a wealth of helpful information. Thank you for sharing your knowledge! My son received an Eichhorn wooden train set for Christmas last year and we are looking to expand. His set has a shed, but no roundhouse, so looking at the Thomas one you mention. Wondering about Right Track sets as they are a bit less expensive than some of the others we’ve seen. Do you know about their compatibility with Eichhorn and Thomas? Hello! I’m glad you’ve found the site to be helpful! I just tested some Eichhorn tracks with our Thomas roundhouse, and they’re completely compatible. I don’t recommend buying anything made by Right Track — their tracks have a lot of issues. For inexpensive bulk tracks, I generally recommend Conductor Carl wooden train tracks. Do you know if the old ikea tracks work with the new ones? We have the old set from our older child. I want to expand the set for our younger child who is way more into trains. But I see on the website that they have changed the style to all wooden. I don’t want to get new stuff if it won’t go with the old stuff. Thanks! Ah, good question! Fortunately I had our new set and our old set sitting together by my desk so I could check right away. After trying 4-ish of each with each other, they do seem to mostly work together except that the plastic connectors on the old tracks are a tight and sometimes difficult fit with the hole-end connectors on the new ascending/descending tracks. It’s workable, though, because you could just avoid having an old track at the bottom or top of a hill. Hope that helps! That does help, thank you so much! hi ! My son got Thomas & Friends Wooden Railway tracks for christmas. He got the trains that say Thomas & Friends Wood. They will work with the tracks he got correct? Hi Marianna! I haven’t tested it too extensively yet, but so far the Thomas & Friends Wood trains do seem to work on other types of track. I just put together a recent Thomas Wooden Railway set and tried a few Thomas & Friends Wood trains on it, and they did fine on it. Great article. We got given a Jack ‘n’ Jill set of wooden tracks from Aldi. It’s a big 95pc set & looks great. Will they work with Biro & Ikea tracks/trains? I’m currently in Australia & we live in France so don’t want to lug them home to not fit. My brother still has the receipt if I need to return them. Hi Laura! I haven’t encountered those tracks in person before, but after a little research I’m pretty sure they’ll be okay with BRIO and IKEA tracks (though if they’re the old IKEA tracks with the plastic connectors, they may be a tight fit). From a picture I found, they seem like the generic wooden train tracks that are sold under a bunch of different names, and I found this forum post with parents talking about compatibility. Hope that helps! The other option I’m considering is the 42-piece expansion tracks from Conductor Carl. Do you have any recommendation for a motorized train as well? I notice that Brio and Thomas motorized trains are usually priced over $30 each which is quite steep. Are there any alternatives that you recommend? Hello! (And sorry for the late reply — I’m trying to catch up with my blog after taking some time off for family reasons.) I have mixed feelings about the Orbrium tracks…they’re ok. My main concern with that particular set is that the risers in that set are of a type that doesn’t keep the tracks up very well. I haven’t tried the orange extenders out; they may keep the risers steadier, but they won’t solve the problem of the riser tops just letting the tracks slide around. I’m a fan of the Conductor Carl tracks, and the bridge in the 42-piece set is of a type that stays up well. If you want more vertical action than that, Bigjigs and BRIO both make four-legged risers that are especially sturdy. As for a motorized train, I wrote a review of almost all of the battery-operated trains on the market last Christmas that might be helpful. I want to buy and build a wooden train setup for my granddaughter but my space is limited. Basically I can do one big loop. My table will be 11 foot wide but can only be 18 inches deep (with access from only one side since it’s against a wall). Will the turn radius for most wooden train sets fit into such a narrow depth? Yes, the turn radius should fit! I just measured, and the larger size of curved tracks has a diameter just over 17 inches. You could have a second loop inside of that one with the smaller curved tracks if you wanted. We bought a Nuchi starter train set for my son last Christmas based on your recommendations. He loves it! Thanks! It looks like a good value with lots of interesting pieces. Have you had any experience with Kidkraft and its compatibility with major brands? Oh wonderful! I’m so glad he liked the Nuchi set! I don’t recommend KidKraft train sets or track…I had heard about problems with their sets for a long time, but I tried to keep an open mind. But then when I bought a set to review, the first two pieces I pulled out of the container wouldn’t fit with each other…which just doesn’t bode well for being compatible with other brands when you can’t even make tracks that fit with the other tracks in your brand. I really wish they were more dependable on quality, because they look like such a great option in photos!